Nepal is a small, landlocked country situated between India and Tibet, with a human population of approximately 27 million. Nepal has one of the highest reported per capita rates of human rabies deaths in the world. As is the case with many other developing countries, the persistence of this disease is centered on domestic dogs as the primary disease reservoir. Rabies is just one of many serious public health problems in Nepal. It provokes great public concern since most Nepalis readily identify this disease with a painful and prolonged death without options for successful treatment once clinical signs appear. However, while clinical infection is untreatable, rabies is a preventable disease. In Nepal, the rabies problem is perpetuated by several factors, including the lack of routine vaccination among pet dogs and the existence of a large unvaccinated stray dog population. Nepalese health professionals have been calling for the development of a national rabies control program since the early 1980s, but have been unable to institute an effective plan to control this disease. The International faculty at the Tufts Center for Conservation Medicine recognized that gaining control of rabies in developing countries requires a veterinary solution to a serious human health problem. To better examine the problem in Nepal, we organized a workshop in April 2001 in Kathmandu, bringing together animal and human public health professionals, and key governmental and non-governmental organizations interested in or already invested in this problem. The output from that workshop was a concept for a Nepal National Rabies Control Program , developed by the Cummings School of Veterinary Medicine's International Program, Tribhuvan University's Institute of Agricultural and Animal Sciences (IAAS) Veterinary School, and Nepal's National Zoonoses and Food Hygiene Research Centre (NZFHRC), with the support of the Humane Society International (HSI). The concept outlines an ambitious but pragmatic approach to gaining control of rabies in Nepal over a ten-year period, with the long-term objective being the development of a sustainable model for rabies control that can be transferred to other developing countries. 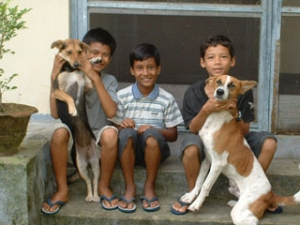 Since March 2002, Tufts efforts have been focused on developing the capacity for dog sterilization and rabies vaccination at our partner institution, IAAS, in Chitwan, Nepal. These efforts are supported by the Elinor Patterson Baker Trust, Humane Society International, and are carried out in collaboration with several Nepal based organizations. This program is focused on two major objectives: developing a model of rabies intervention in Chitwan district, and building national veterinary capacity through curricular development at Nepal's national veterinary school (IAAS).Veterinary students are collecting demographic and socioeconomic data on dog ecology and ownership in the Chitwan region and have developed an education campaign to encourage the practice of dog sterilization, discourage practices that support stray dog populations, and promote the benefits of regular vaccination. Tufts surgeons have conducted faculty and student training sessions on techniques of dog sterilization, and have helped to institute a robust two year surgical curriculum for all veterinary students at IAAS. This program involves community education and an active veterinary student centered dog sterilization and vaccination clinic at the IAAS which provides training to future Nepali veterinarians and encourages them to promote this practice in their communities after graduation. Our recent efforts have grown to include collaboration with the Kathmandu Animal Treatment Centre, the largest stray dog shelter operation in the Kathmandu valley. This non-profit charity has made a significant impact on the health of the stray dog population through vaccination and sterilization campaigns and community service work in the valley. They have employed graduates of the IAAS veterinary program and work actively with other groups toward a comprehensive national program. More on their focused efforts can be found on the Kathmandu Animal Treatment Centre website. Through Tufts' targeted efforts in collaboration with government partners and humane organizations we hope to greatly increase the capacity of Nepal to gain control over its dog population, and this devastating disease. As the dog population becomes better managed and human cases decrease, our investigations will focus on potential native wildlife reservoirs.